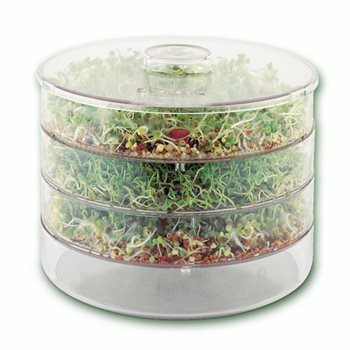 This 3-tier germinator allows you to grow three types of seed simultaneously, giving you a variety of delicious fresh sprouts to enjoy. Turn your kitchen into a greenhouse! Discover how much fun it is to cultivate your own fresh and crunchy shoots and sprouts using an Original BioSnacky germinator and BioSnacky Seeds from organically controlled crops. Sprouts and shoots are the perfect accompaniment to a well-balanced diet at any time of the year and are a great source of vitamins and minerals. Why not try one of our tasty recipes? Correct use of our top-quality Original BioSnacky Seeds will ensure optimum cultivation results in all BioSnacky germinators and glass germinators. A great source of vitamins. Provides fresh and crunchy shoots every single day. Optimum light incidence and air circulation ensure perfect conditions for growth. I am so impressed with this germinator. It's easy to put together and so simple to use. I am new to sprouting so didn't want to make things too complicated for myself and this germinator is perfect. It would have got 5/5 but I gave it 4/5 because some of the smaller seeds I've been sprouting tend to get stuck in the grooves in the trays. Otherwise, it couldn't be better. If you're looking for a germinator, buy this one now! Seeds sprouted very quickly. I think the trays should be deeper as they are crushing tops of seedlings. Would also like a spare water tray so that I could lift seedlings straight onto the spare one. I have purchased this germinator, because my friends have it and enjoy using it. As for myself, I am not able to make the drainage holes to work. I water the trays by hand, independently. I have no idea why it does not work. I followed all instructions that came with the product. But the quality is fine.